Have you ever played a game in the browser address bar? Well a new innovative game called URL Hunter has now taken the gaming area into the browser address bar using HTML 5. 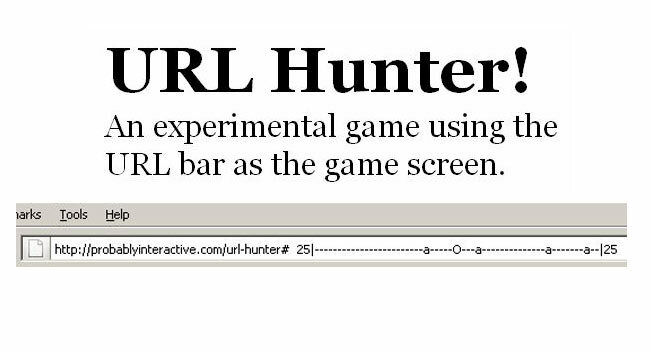 Using the new HTML 5 canvas tags a creative developer named Corey from ProbablyInteractive has now been able to take the game into the browser address bar to created an experimental URL Hunter game to show how powerful HTML 5 can be. The URL Hunter game uses ASCII characters that move in the address bar. You take control of an “O” which can be moved around with the Left and Right keys on your keyboard. The aim is to position your O over one of the “a” characters that moves back and forth along the play area.As soon as your have the ‘a’ in your sights press the spacebar to capture it. Even though the URL Hunter is a small and simple game, it is a great example of how HTML 5 can we used to control a browser and is just a glimpse of things to come. To check it out visit the URL Hunter website to give it a blast.